Markets are flattish on no real news. Bonds and MBS are flat as well. Initial Jobless Claims rose to 276k from 265k last week. In other economic data, the ISM Milwaukee rose to 57.8 while the Chicago purchasing Manager Index jumped. Consumer comfort fell however to 42.8. Job cuts fell 13,4k to 48.2k in March, according to outplacement firm Challenger Gray, and Christmas. Note that Boeing announced 4500 job cuts yesterday, and the financial industry is going through another round of lay-offs. Not everything is grim in the labor markets, however. Some parts of the country are seeing outsized wage growth. Mohammed El-Arian on what to look for in tomorrow’s jobs report. The numbers to watch: wage growth and the labor force participation rate. TRID issues have shut the jumbo securitization market down for the moment. Non-bank jumbo originators are sitting on the sidelines at the moment because they can’t move their inventory. Another unintended consequence of TRID. One unappreciated fact relating to the 10 year has been the massive short position that built up in them ahead of the Fed’s hiking rates. 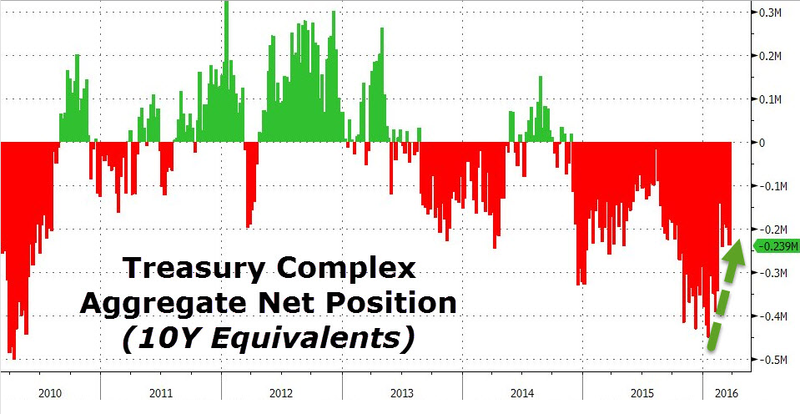 Now that the Fed is becoming more dovish, it is creating a short squeeze in Treasuries, which is pushing down rates. The punch line is that the bid under Treasuries (and thus the forces pushing yields down) are somewhat temporary. Markets are higher following dovish comments from Janet Yellen yesterday. Bonds and MBS are down. Janet Yellen spoke yesterday in NY and reiterated the dovish statements from the last FOMC meeting. Stocks and bonds rallied on the announcement, with both going out on their highs, although bonds have given back their gains this morning. Fed Funds futures now assign a 0% probability of an April hike. It is very much a Goldilocks moment for stocks, not so much for the economy. For the time being, economic weakness is good news for stocks because it keeps the Fed on the sidelines. As if on cue, Boeing announces it is cutting 4.500 jobs. Overseas yields are still heading lower, with the German Bund trading at 16 basis points. As long as bond yields throughout the world trade at such low levels, the 10 year will have relative-value trading support. This means that as rates in Europe fall and go negative, investors will swap out of Bunds, which really have nowhere to go but down and buy Treasuries. The world is trading as if inflation is never, ever, ever coming back. There are a lot of “this time is different” stories going around about technology and inflation. It may turn out that the best possible trade is borrowing money for 30 years at 3.375%. Mortgage Applications fell 1% last week as purchases rose 2.1% and refis fell 3.3%. Refis fell to 52.4% of total loans, compared to 58.6% a month ago. Payrolls increased by 200,000 according to outplacement firm ADP. The Street is looking for an increase of 210,000 on Friday. In the Webster’s dictionary under real estate bubble, people should place China. Here is an example of the sort of stuff that is getting built these days. It reminds me of the height of the US property bubble when a thief supposedly broke into a McMansion with a boxcutter. Builders were cutting every corner just to make houses big. 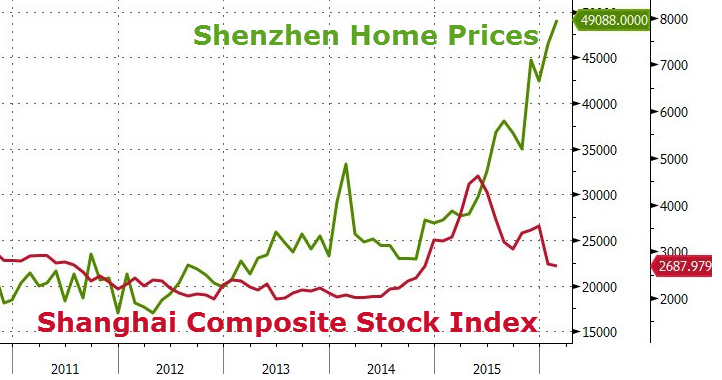 I have said this before: China is going to be an epic battle between Mr. Market and Big Communist Government. Compare property prices to stock prices. Markets are lower this morning on weaker commodity prices. Bonds and MBS are up small. Pending Home Sales increased 3.5% MOM and are up 5.1% YOY. This is the best number in a year, and points to a strong Spring Selling Season. Lack of inventory remains a problem. Janet Yellen will be speaking around noon EST today. Don’t expect her to break any new ground, but just be aware. Inflation remains tough to find, but both BlackRock and PIMCO are calling for investors to add an inflation hedge, either by switching out of Treasuries into TIPS or by buying gold. Barclay’s is calling the latest rally in commodity prices a dead cat bounce, and is calling for a steep decline as fast money exits en masse. 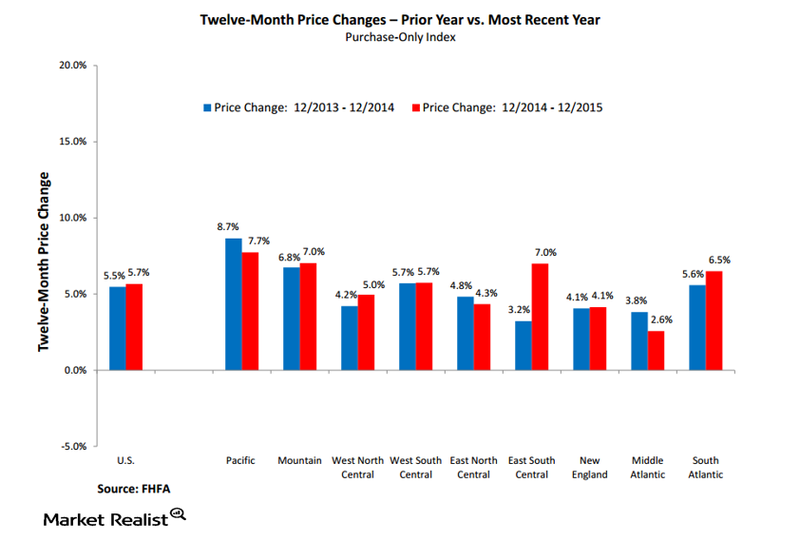 Home prices rose .52% month-over-month according to Case-Shiller. Prices are up 5.4% YOY. 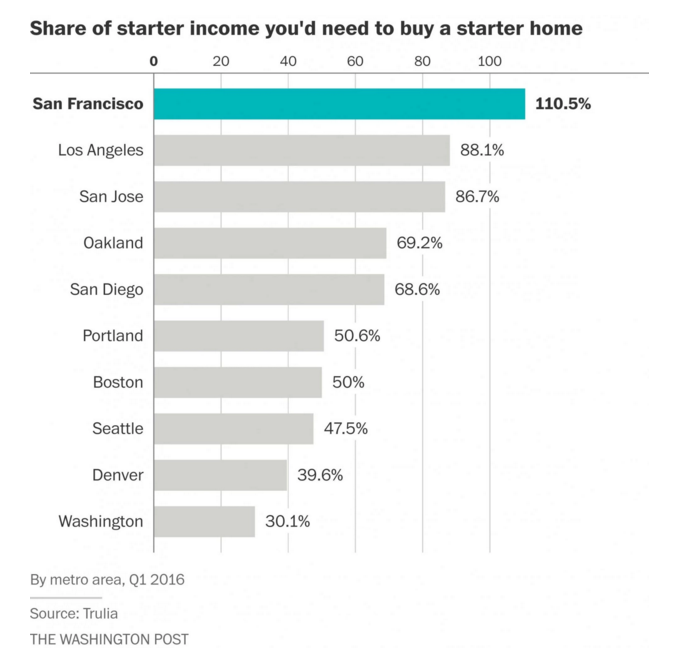 Portland, Seattle, and San Francisco reported the biggest gains. Again, tight inventory remains an issue, along with tight credit for the first time homebuyer. Prices continue to defy gravity in New York City, however the demand for luxury condos is beginning to wane. 423 Park Avenue, now home of the tallest residential building in the Western Hemisphere, has 141 apartments for sale and luxury buyers are beginning to fade as foreign money is hesitant. Yet Manhattan is dotted with cranes, largely building high-end condos. Homebuilder Lennar reported better than expected earnings this morning. EPS is the highest third quarter number since 2006. Average selling prices increased 12% to $365,000 while new orders increased 10% in units and 15% in dollar volume. Stocks are under pressure this morning as commodities drop. Bonds and MBS are up small. Durable Goods Orders fell 1.8% last month, slightly better than expectations, but when you strip out transportation, the number was a huge miss. Capital Goods orders (a proxy for business capital expenditures) fell 1.8% missing by a country mile. In other economic data, the Markit PMI numbers were barely expansionary and the Kansas City Fed improved slightly, but is still negative. Mel Watt is going to have a decision on principal mods for conforming loans held by the government within the next 30 days. The left has been pushing FHFA to do this for years. Why the (expected) change? 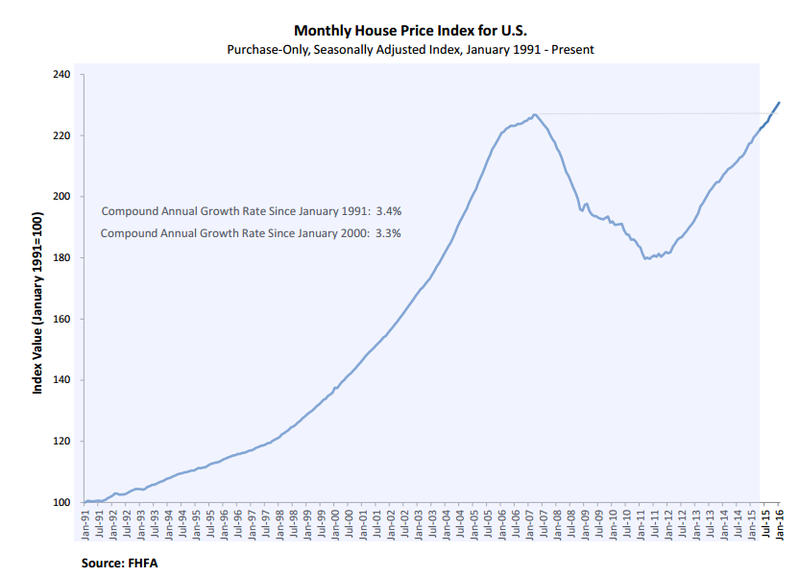 Probably the FHFA House Price index, which has now recouped all of its losses from the bubble years. HARP may go away as well – FHFA is toying with the idea of a high-LTV refi. Cash sales are at their lowest level in 7 years, according to CoreLogic. In 2015, they accounted for 34% of all sales. The peak was January 2011 when they hit 47%. Pre-crisis, that number was in the high 20s. 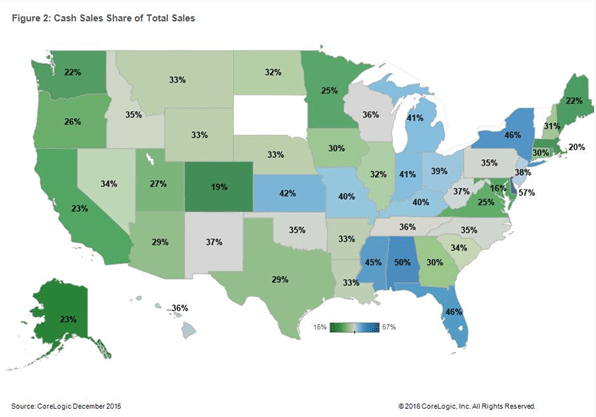 Unsurprisingly, the states with the highest foreclosure pipeline and the lousiest real estate markets have the highest cash sales percentages. Mortgage lenders are on net still easing credit standards, however they are doing it at a slower pace, according to the latest Fannie Mae Mortgage Lender Sentiment Survey.Government loans actually were tightened. Mortgage Applications fell 3.3% last week as purchases fell 1% and refis fell 4.9%. Despite an 11 basis point drop in the 10 year yield, mortgage rates barely budged, falling only 1 basis point. New Home Sales ticked up slightly to an annualized pace of 512,000. The increase was driven entirely by building out West where there is an acute shortage of housing. Note that homebuilder KB Home reports after the close tonight. The median sales price increased 2.6% to $301,400. Hawkish comments out of St Louis Fed President James Bullard: “You get another strong jobs report, it looks like labor markets are improving, you could probably make a case for moving in April,” Bullard, who votes on policy this year, said in a Bloomberg interview in New York Wednesday. “I think we are going to end up overshooting on inflation and the natural rate of unemployment.” Perhaps, but the doves are in control of the FOMC at the moment. If negative interest rates in Europe and Japan don’t do the trick, then the next step is “helicopter money” which has always been a textbook-only idea but is gaining fans. The government would issue debt directly to the central bank, which would print the cash which the government would immediately spend, bypassing the banking system entirely. The theory is that if there is a liquidity trap (where banks just sit on Treasuries and won’t lend them out), this would inject the money directly in the economy. It would probably require legislation to change the way central banks are run in Europe (and certainly the US), and if there isn’t the political will to do massive Keynsian spending programs, then there won’t be the political will to do this. What are the risks to doing it? Who knows? Weimar Republic-esque inflation is one, but probably the biggest one would be a loss in confidence in central banks globally, which would probably mean a collapse of the banking system worldwide. Anyway, it is just a theory that is gaining some traction, but it probably remains in the textbooks. And don’t forget – ZIRP and NIRP aren’t “free.” Insurers need to earn a certain rate of return on their money to fund future payouts, and the actuarial tables couldn’t care less than rates are 0%. The latest victim is the oldest insurance company in the world, Lloyds of London who reported a big drop in profits due to sub-par investment returns. Markets are lower this morning on no real news. Bonds and MBS are down. Existing home sales fell 7.1% in February to an annualized pace of 5.08 million. Bad weather in the Northeast and the Midwest may have played a part. Sales are up 2.2% on a year-over-year basis. Lack of inventory and affordability remain the biggest issues. The median home price increased 4.4% to $210,800, and total inventory is about 4.4 month’s worth. All cash transactions were 25% of sales and investor purchases ticked up to 19%. The share of first time homebuyers slipped to 30% as affordability problems and worries about the economy kept many younger buyers on the sidelines. 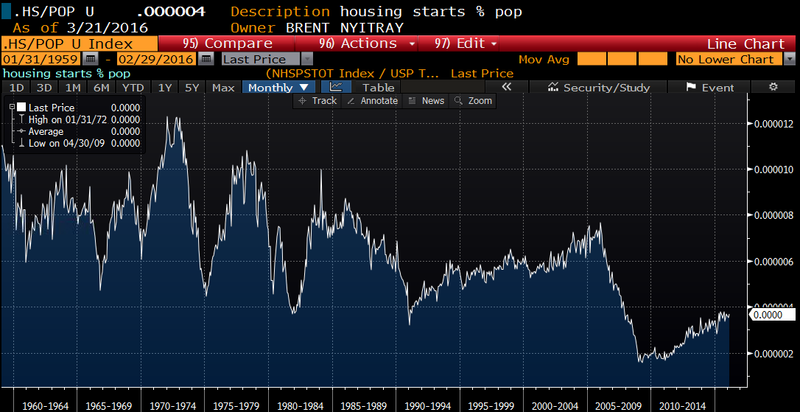 Given the tight inventory, why aren’t homebuilders aggressively adding supply? Finding affordable land plots and skilled labor appear to be the problem. It is amazing that 10 years after the housing bust, we are still 25% below the long-term average in housing starts. I adjusted housing starts by population, and the graph below gives you an ideal of how much we have underbuilt. We still just barely reached the low of the 81-82 recession, which was the nastiest since the Great Depression. What is going on? My guess is that the government is the problem, via zoning laws in some localities, and general Washingtonian regulatory funk tying up the credit markets. Correcting whatever problem is holding back housing is the difference between a tepid, meh economy of 2% growth, and a recovery where we see 3% growth and wage inflation. It would be nice if someone running for office noticed this and said something. Unfortunately, they only acceptable answer these days is that the financial sector isn’t regulated and needs to be sat on more. Investor demand for paper isn’t necessarily the issue either, as right now anyone who can fog a mirror can get an auto loan. It is the same old story: new entrants come into the market, take risks that the established players won’t take, and a new market takes off. One thing that is different these days is technology. Lower credit borrowers will get a GPS installed on their car (no, not a nice navigation system, but a transmitter that tells the lender where the car is). Lenders also now have the ability to disable the car remotely. The Chicago Fed National Activity index reverted to negative territory last month to -.29 from a upward-revised .41. The 3 month moving average is negative, indicating the economy is growing slightly below trend.